your one-stop virtual bag of dice! Notice: Due to the new EU copyright directive, content filtering is now mandatory for any site that hosts user-provided content. While I'm sure there will be government-sanctioned filtering services that I could use for Rolz, I'd still be personally responsible for every instance where that filtering fails. That is not a risk I'm willing to take. As a consequence, Rolz will no longer be available within the European Union. I'm not yet sure about the timeframe, but I aim to be in compliance before this becomes EU member law in my native country. By using this site, you accept the points stated above and agree to abide by and consent to the Terms and Conditions. 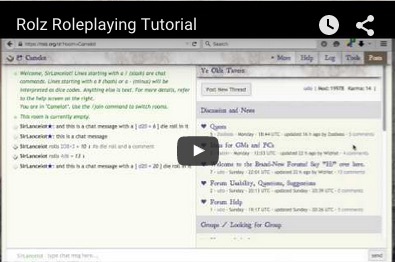 Our Dice Rooms are special chat rooms designed to facilitate pen&paper roleplaying online, in groups - here you can have joined sessions with other players. The Rolz.org dice roller supports a variety of roleplaying systems. It interprets dice codes presented in the standard notation commonly used in roleplaying games, but it also knows advanced rules. Refer to the dice code documentation for more info. Please enter the dice code into the input field and hit enter. You can also click on the dice on the right to load them into the field. Click double if you want to roll one of them right away. Keep the highest (or lowest): if you want to roll multiple times but have only the highest result(s) count, use the modifier "H". If you want only the lowest result(s) counted, use "L". The default die of this roll type is d10, so 4H2 can be used as a shorthand for 4d10h2. Fudge Rolls: if you want dice to have values from -X to +X, use "U" instead of "D" in the dice code, followed by X. Hero System damage rolls: total result is counted as stun damage. On top of that, body damage is calculated by counting ones as zero, 2-5 as 1, and sixes as 2 points of body damage. You can also use the "*" operator for the stun multiplier. Wild Die (D6 System): The D6 System has a special rule for one of the dice in each roll, it becomes the "Wild Die". The Wild Die is rolled again as long as it comes up with the max result, but if the first roll is a 1 the next roll as well as the highest result of the other dice becomes a penalty. Two ones make a critical failure. Stress Die (Ars Magica): Roll the Ars Magica Stress Die (reroll ones and double the result, 10s count as zero on initial roll, it's complicated). The number following the A is the number of botch dice (can be 0). Anima Open Die Roll: Roll a die, if the result is higher than a certain threshold: roll again, add the result, increase the threshold by one, roll again. If the first roll is lower than the failure threshold, the result is a fumble with a certain failure level, for more information refer to: animarpgbeyondfantasy.wikia.com/wiki/Basic_Game_Mechanics. By default, the die is a D100, the up-roll threshold is 90, the fumble threshold is 3, and the fumble level modifier is 15. Count the number of successes: to see how many dice rolled equal to or greater than some number, use "E". The default die of this roll type is d6, so 4e4 can be used as a shorthand for 4d6e4. Successes with additive re-roll: to see how many dice rolled equal to or greater than some number, use "R" if you want the individual die maximum to trigger a re-roll. This way, you can have target difficulties greater than the max number of the die. The system also gives you the number of ones rolled (if there were any) so you can judge whether an action resulted in a fumble. The default die of this roll type is d6, so 4r8 can be used as a shorthand for 4d6r8. Successes minus failures: to see how many dice rolled equal to or greater than some number, and subtract the amount of ones rolled, use "F". The default die of this roll type is d6, so 4f4 can be used as a shorthand for 4d6f4. Successes "plus": to see how many dice rolled equal to or greater than some number, and roll every max result again and see if it's another success, use "M". The default die of this roll type is d10, so 4m4 can be used as a shorthand for 4d10m4. Successes with everything: to see how many dice rolled equal to or greater than some number, and roll every max result again, and subtract the amount of ones rolled, use "S". This is probably the one you want for most systems. The default die of this roll type is d10, so 4s4 can be used as a shorthand for 4d10s4. Example: 1D6:6S4 , meaning 2d6 will be rolled and 4(+) is a success. Example: 5D8:6S10 , here a d8 and a d6 will be rolled, a sum of 10(+) is a success, the entire check is rolled 5 times. Maximum possible die result counts as two successes: to see how many dice rolled equal to or greater than some number, use "X". The default die of this roll type is d6, so 4x4 can be used as a shorthand for 4d6x4. Random names: Use gen name [template], where [template] is the style of name you want to create. Supported templates are archaic, boy, byname, default, dorf, elf, fantasy, girl, highgothic, lowgothic, primitive, rome, scifi, star, troll, wh. You can also chain several templates together by separating them with a space in between. Dark Heresy / Warhammer 40K Characters: Use gen dh to generate a basic Dark Heresy character. There are many generation options for careers and advancement, refer to the generator's help page for more information: gen dh help. To see how an individual result came to be, let the mouse pointer hover above the number to see more details. If your browser won't show the details, click on the result to expand it instead. Multiple rolls at once: to roll for multiple things (e.g. an attack and a damage roll), you can chain together dice codes by semicolons. A number of rolls: if you want to repeat the same roll for a number of times, use the repeat command. If you also want the sum of the rolls, use sum instead of repeat. explode: specify one or more results that cause the die to be rolled again and the result added up ( explode=5,6 4d6 ) - to cause the max result of the die to explode without having to specify what it is, use the explode=max shorthand. You can combine attributes with another, and also use macros (see below) to invoke them. It doesn't matter if an attribute comes before or after the actual dice code, as long as they are separated by a space. You can define macros to automate repetitive die rolls or often-used number constants (such as your attack bonus). Use a macro called " !attack " or even " !attack+4 "
Saving and loading user data: you can save your customizations (such as the macros you defined) for later. To save your current session, type "save MyCoolUserName" where MyCoolUserName is an arbitrary name for your session. You have to remember this name in order to retrieve the session later with the corresponding command "load MyCoolUserName". By using this site, you agree to honor the Terms and Conditions.